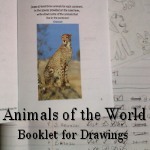 Half-sized and quarter-sized booklets are useful for numerous educational applications. There are three examples of using half-sized booklets at donnayoung.org and they are the Half-Sized Nature Journal, the Make a Word Book, and George Washington's Rules of Civility Booklet. 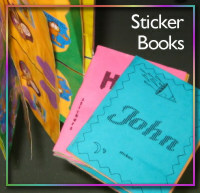 I have made files that you may print to make 1/2-sized booklets for your children and students. The files are designed to print on full sized printer paper. The files can then be folded and stapled or sewn, or cut and hole-punched. Both have several rule sizes; both have blank top files; and both have one-side ruled, one side blank. This one is different from my other 1/2 sized booklet files. Notice where the hole punches go- on the outer edges of the paper instead of along the cut line. The folded booklets can be stacked, folded, and stapled. They can also be cut and hole-punched.